Hakusan, Japan, September 1, 2017 – EIZO Corporation (TSE:6737) announced DuraVision FDF2382WT and FDS1782T – 23-inch and 17-inch touch panel monitors with 1920 x 1080 (full HD) and 1280 x 1024 resolution respectively. 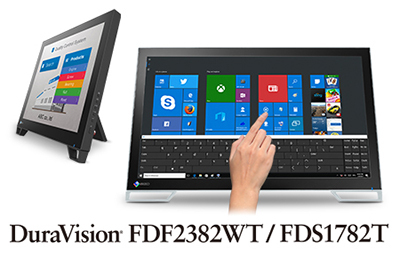 The DuraVision FDF2382WT and FDS1782T feature projected capacitive (PCAP) touch technology which is more durable and reliable compared to other touch technologies. Both screens feature a non-scratch surface with a hardness of 5H (Mohs scale), making them durable enough to withstand long-term use. This makes them especially suitable for environments with high public access such as kiosks, or for use in harsh environments such as factories. Both monitors accept touch input from a bare finger or dedicated stylus. The screen detects up to 10 simultaneous touches so users can easily operate a variety of applications. With 10-point multitouch multiple people use the screen at the same time. Furthermore, compared to 5-point multitouch the screen has higher touch sensitivity, making writing with a finger or stylus smoother. For example, when a medical doctor writes notes about a patient’s condition, the monitors ensure each pen stroke comes out clear and as intended. This feature also benefits environments where delicate control over touch movement is needed – such as managing audio sliders in sound engineering or flight strips in air traffic control. Furthermore, the DuraVision FDF2382WT and FDS1782T are equipped with technology which calibrates the touch sensitivity of the screen to minimize incorrect touch response due to environmental factors and electromagnetic noise. This ensures that the screen maintains accurate touch interaction during use. When taking notes in a business meeting, signing digital documents, or in other situations where writing is called for, the monitors’ palm rejection technology allows the user’s hand to rest directly on the screen without causing unintended touch input. Furthermore, touch detection can quickly be toggled via the buttons on the monitor’s side so users can enable or disable touch functionality as the situation or environment calls for it. The fully flat surface of both monitors provides a seamless touch experience that reaches to the edges of the screen. This makes swiping motions and scrolling a breeze. The typical brightness of DuraVision FDF2382WT and FDS1782T are 260 cd/m2 and 350 cd/m2 respectively. The LED-backlit IPS panels have wide viewing angles that minimize color shift and contrast changes when viewing the screen from the side. The surface of the panel is also coated with an anti-glare treatment for further clarity in bright ambient environments. The reclining stand equipped with both monitors provides flexible positioning to allow them to rest on a desk like a laptop and recline back to the desired angle. This makes it easy to place the monitors in the ideal position for the most comfortable use in any environment. The DuraVision FDF2382WT and FDS1782T will begin shipping from October, 2017. Date of availability varies by country so contact the EIZO group company or distributor in your country for details.